With the shuttle Discovery's extended mission heading into the home stretch after a second successful spacewalk Wednesday, mission managers say the goal now is to help the International Space Station's crew unpack and outfit the newly installed Permanent Multipurpose Module, or PMM, before the shuttle departs Sunday. President Obama will call the space shuttle Discovery and International Space Station crews on Thursday at 5:03 p.m. EST, NASA has just confirmed. This was the 155th spacewalk devoted to station assembly and maintenance since construction began in 1998. U.S., Russian, European, Japanese and Canadian astronauts have logged 973 hours and 53 minutes of EVA time. This was the seventh EVA in the career of Steve Bowen and second for Al Drew. Steve has accumulated 47 hours and 18 minutes of spacewalking time in his previous excursions on three spaceflights. Al's two spacewalks came this week, totaling 12 hours and 48 minutes. EVA ENDS. Repressurization of the Quest airlock module began at 4:56 p.m. EST, marking the official end of today's spacewalk by Steve Bowen and Al Drew. The EVA lasted 6 hours and 14 minutes. The airlock hatch has been closed and locked. Standing by for repressurization. Al is inside the airlock and Steve is about to ingress the module too. The astronauts have completed all of the chores planned for the spacewalk, plus a get-ahead task of relocating a robot arm adapter to the Zarya module. Al is going to make his way back to the airlock while Steve finishes the cleanup tasks outside to conclude this EVA. Steve wasn't able to get the light cap reattached to Al's spacesuit helmet. It's still dangling on the power cords. A similar situation happened on STS-128 when headlight assembly came off spacewalker Christer Fuglesang's helmet. The lights on Al's helmet have come off. Steve is gonna climb over there and help reinstall this cap. Al is working on the Tranquility module to peel off some no-longer-necessary insulation around a row of connectors. Now passing the five-hour mark of this spacewalk. Steve has placed one of these camera lens protectors on a Dextre video camera. He's now headed to the mobile transporter's payload holder to install a cover on that camera too. These are designed to give the cameras some self-defense against thruster pluming from visiting spacecraft docking and departing the station. Two-for-two as Al fixes both loose beams. Success for Al in getting the first of the two radiator stowage beams tightened. And now onward to the radiator grapple fixture stowage beam, installed back on STS-131 last April. But the spacewalkers then had trouble getting this handling structure secured. It would be used in the event a radiator ever had to be replaced. Al is gonna take a look and see what can be done. "I'll head down to the underside of that same truss, on the Earth side of it, and where we've got these, basically receivers for these grapple bars that go on the radiators. The radiators themselves, they fold out with accordions and if they're folded up in order to move and install them for replacement, they've got this big, it's like a double Y-shaped beam that allows you to grapple. Itself ties to the radiators and it has a grapple fixture on it so the robot arm can grapple it. "Well, when you've got the radiator deployed you need some place to park that grapple beam and so we've got these stowage receptacles for it and on a previous spacewalk they went out there and tried to bolt them down and the bolts wouldn't sit quite, so they're wobbly. My job is to go out there and take a look at it, do some troubleshooting to see if we can figure out why these things aren't cinched down as tightly as they'd like them cinched and, if I can, fix it so that they are cinched down where they need to be. I'll look at both those beams." All just accomplished a brief task to tidy up a thermal shroud on a fluid disconnect valve on the space station truss backbone. "There is one of the boxes out there has a connector to it, a big data connector and the bale itself needs to be shielded from sunlight so it doesn't get too hot or too cold. Some of that shielding, that blanket, has peeled away and the program's concerned that it's getting sunlight, it's getting put through, it's getting too hot. "I'll simply take that blanket, put it back over top of the connector and use a wire tie, it's a coat hanger, really that's all it is, and wrap it around that to hold it down so it doesn't peel back again, take a quick picture of it so people can see it's in the proper configuration." Before Steve bids farewell to the robot arm, he's placing a lens shield on the elbow's television camera to protective it from rocket thruster plumes. The Port 3 CETA light task is complete, Al says. Installation of a light inside the space station truss is next for Al. "I'll go over to the port side of the truss segment. There is a working light that we can put inside for people who do work inside the truss because it's obviously dark even when the sun's up. It's called the CETA light and I will take that light out there and install that one and get it plugged in and then they can do a quick power check while I'm out there." The station arm has returned Steve to Columbus module where he first hopped aboard earlier in the EVA. He's egressing the arm and removing that portable foot restraint for stowage atop the module. Al is making a quick stop at the airlock to recharge his spacesuit oxygen system in case today's spacewalk runs long. Next in Steve's column on the to-do list is removing a no-longer-needed thermal blanket from the side of Dextre. Al is revisiting the external television camera on the Starboard 1 truss that the spacewalkers adjusted the stanchion Monday. He is going to fix a sunshade that's partially obstructing the camera's field of view. This camera has been attached to Canada's Dextre robot, completing the long assembly sequence for the Special Dexterous Manipulator. The International Space Station's arm has positioned Steve at the Dextre where he will install a camera on this dexterous robot. Meanwhile, Al has made his way over to the new Express Logistics Carrier No. 4 that the astronauts installed onto the space station Saturday. He is removing a thermal cover from some electronics that's no longer needed since the platform is receiving station power now. "There's a computer control box – hard to believe a platform needing computer control but this one does and it has a thermal blanket on it to keep it from getting overly warm and we'll, it needed that for the launch part but for sitting in space it doesn't need that blanket. So I'll go out and grab that blanket and roll it up and put it in a bag and if you've ever seen Charlie Brown and Linus's blanket, that's the part that worries about me, this blank suddenly turns ugly and attacks me." LWAPA has been secured on the port sidewall in the rear of shuttle Discovery's payload bay with a single bolt that Steve has engaged. The Lightweight Adaptor Plate Assembly -- LWAPA -- is part of a materials science experiment that was exposed on the outside of Columbus. The other two pieces of the experiment have been returned already and the LWAPA is the final section. It contains about 10 percent of the project's data. Perched on the end of the space station's robotic arm, Steve has the LWAPA in his hands while the crane swings him from the Columbus lab down to the space shuttle's payload bay. Steve has unbolted and removed the LWAPA experiment carrier platform from the European Space Agency's Columbus lab module. This task had been planned on STS-131 last April but had to be deferred by time constraints. Steve has set up the foot platform on the robot arm and gotten aboard. The arm will maneuver the astronaut around while picking up the Columbus bracket and hand-carrying it down to the shuttle payload bay for stowage. Take another look back at the space shuttle Discovery's last launch with this beautiful series of photographs from NASA cameras around the Kennedy Space Center. 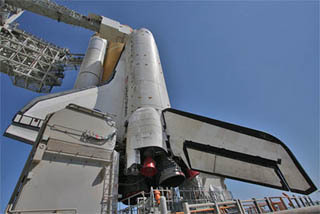 Al will spend the next little while stowing away the vent tool and buttoning up the pump's storage enclosure for the payload to await its return to Earth this summer aboard shuttle Atlantis, which will be outfitted with the necessary carrier. Al has expelled the remaining 10 pounds of ammonia from the failed pump using the equipment organized and deployed during the first spacewalk on Monday. "For the second day's spacewalk, I'll start off on my part to go out to that failed pump module and there's some residual ammonia sitting in that tank. This isn't kind of, like the bottle of ammonia you have sitting on your sink in the kitchen or your bathroom. This is a hundred percent ammonia. It's pretty noxious stuff and we don't really want to carry that back down to Earth with us so what we can do is vent that out into space where it's harmless and we can bring it back in an empty tank, depump module. "So what I'll do is take a vent monitor, I've already set up on the first day's spacewalk when we bring back this failed pump module, I'll connect that vent line to the module itself and close a belt to let it vent itself out into space. It takes about maybe ninety seconds, two minutes for all the ammonia to vent itself overboard. "Once that's done, I'll close up and cap that failed module. I'll close up the tent flap behind it and let it sit until a future mission brings it back to Earth and then what I'll do is take that vent, those vent tools and those bags that were left over from that original spacewalk, put them back in the original bags and put them back on top of the airlock where those bags stay for any future, as we have to change another pump module or any other spacewalk for repair." Al is making his way from the airlock module to the neighboring External Stowage Platform No. 2 where the final work to safe that failed ammonia pump will be performed by venting the remaining coolant inside. Meanwhile, Steve is gathering some equipment and heading for the outboard end of the European Columbus module for retrieval of an experiment support bracket. Both spacewalkers have emerged from the airlock. This is Steve's seventh EVA. He did three during the STS-126 shuttle flight to the station in 2008, two last year on STS-132 and the one Monday for a total spacewalking time of 41 hours and 4 minutes. Al is taking his second spacewalk today after spending 6 hours and 34 minutes outside on Monday. The EVA got underway only 24 minutes behind schedule, the result of having to track down and replace a leaky seal in Steve's suit. EVA BEGINS. The spacewalkers switched their suits to internal battery power at 10:42 a.m. EST, marking the official start time for today's EVA by Steve Bowen and Al Drew. This is the second of two spacewalks planned during Discovery's mission at the International Space Station. Depressurization is complete and Steve has opened the Quest airlock's outer hatch leading to space. No problems reported in that leak check. Both suits are doing fine now. Depressurization is pausing at 5.0 psi for a planned leak check. Airlock depressurization has begun in advance of today's EVA. With Steve and Al now inside the section of the airlock that will be depressurized shortly, the inner hatch to the rest of the International Space Station been closed. Final steps in the suitup process are being completed now. The spacewalkers are being outfitted with the SAFER backpacks that would enable an untethered astronaut to fly back to the station. With the new seal installed, Steve's suit has passed the leak check. The crew has found a bad seal on the air-scrubbing canister in Steve's suit as the culprit for the leak. They are replacing it right now with a spare that's available inside the airlock module. A second leak test failed too. The astronauts are going to check Steve's boot connections and continue to look for the leak source. Standard checks on Steve Bowen's spacesuit have revealed a leak. The fellow crewmates helping on the suitup process have removed his helmet and gloves to reseat those seals. Another leak test will be performed to see if that cleared up the problem. The latest version of the NASA Television schedule (Rev. F) can be downloaded here. Flight Day 7 has begun with this morning's wakeup call from Mission Control. Venturing outdoors from the International Space Station today for their second of two EVAs during shuttle Discovery's mission, spacewalkers Steve Bowen and Al Drew have a long list of maintenance chores to accomplish. This assorted collection of odds and ends is described as "cats and dogs but no elephants" because none of the various tasks are major.